Ersatz though it may be, it’s certainly nicer than the high rise condo developments at all the other resorts. 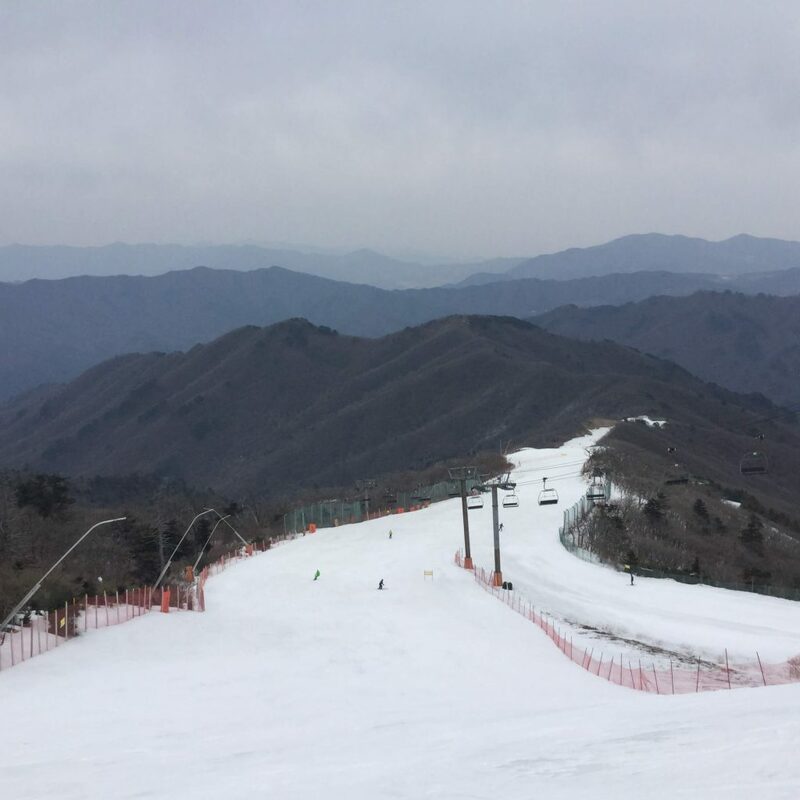 Muju Deogyusan also offers the greatest vertical drop found in Korea (bar the newly-constructed-for-the-Olympics Jeongseon Alpine Centre), so if you’re looking for a selection of reasonably long runs you’ll find them here; at just over 6km, Silk Road is the longest run in Korea. 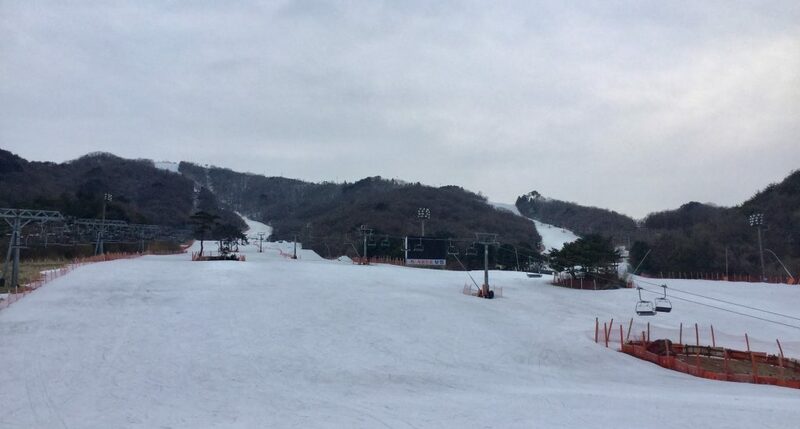 The terrain isn’t wildly exciting though, and the more southerly location doesn’t help the snow quality (though at least they get enough natural snow, rather than relying the man-made stuff on the hills around Seoul). It’s also a slightly odd setup, with two base areas and two corresponding top stations – the Seolcheon base with the gondola up to Peak 2, and the Mansan base with its main chair up to Peak 1. The two sides are mostly detached, with one connecting run from Mansan to Seolcheon, and one chairlift for going the other way. 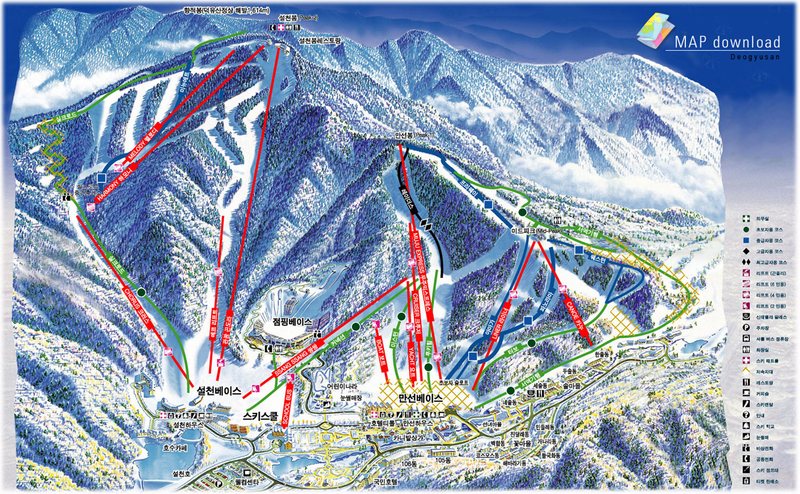 The Mansan side has more lifts and runs, while the Seolcheon (gondola) side has fewer but the runs are longer. Basically, learners and low intermediates will be happy on the Mansan side, while more advanced riders will want to session the gondola. It’s a pretty slow, long gondola ride, and though the runs are fairly long you’ll have them all skied out in a couple of hours. Vertical. Korea’s greatest vertical drop, and some nice long runs as a result. Beautiful mountain views of Deogyusan National Park. The alpine village at the base makes it a good choice if you’re planning on staying for a couple of nights. Day trips from Seoul. Although it’s possible, the long journey time means you’ll spend more time travelling than skiing. Muju Deogyusan lift tickets follow the standard system in Korea, with the operating hours split into day & night by a 2-hour snow grooming break at 4:30pm; the daytime hours (8:30am – 4:30pm) are subdivided into morning and afternoon, the nighttime hours (4:30pm – midnight) are subdivided into evening and night. You can get a lift ticket for any one of the time slots, or for various combinations; weekends and holidays also have an early morning ticket from 6:30am. Airbnb works really well in Korea too, and they have plenty of listings in the Muju area. If you haven’t used Airbnb before, you can get a 35-dollar discount off your first rental by signing up through Snow Guide Korea; simply click on this link and register! By public transport & shuttle bus altogether it takes about 3.5 hours from Seoul. The free resort shuttle runs from the small town of Muju, on the edge of Deogyusan National Park. You can get to Muju directly from Seoul’s Nambu Bus Terminal (at time of writing, departures at 07:40, 09:20, 10:40, 13:40, 14:35), taking 2.5 hours and costing 13,400 won (details here); otherwise, you have to change at Daejeon, making for a long journey with two changes of bus. When returning in the evening, if your destination is Seoul bear in mind that if you take the 18:30 shuttle bus down you’ve already missed the last direct bus from Muju to Seoul and will have to change at Daejeon; the 15:30 shuttle is therefore better. The shuttle schedule is here. To decipher it, 출발 = departure time, 무주읍 = Muju Town, 설전면 = Seolcheon-myeon, and 리조트 = resort. The diagram at the bottom of the page shows the location of the shuttle bus stop near Muju bus terminal. Any questions about Muju Deogyusan Resort? Leave a comment below! The shuttle bus stop was changing to P1 near the information center on the front of bus terminal. Hi, thank you for the heads up! I’ve checked the new shuttle bus info on their website, and have now updated the info on this page. Cheers! Hi! We are planning to visit on Jan.11, is it possible to ride the free shuttle bus without advance notice?Like we will go there on the spot? Hi Kayce, yeah that’s no problem at all, no reservation needed. Just be in the right place at the right time, as per the info above. Have a great trip! Wow, great review and information. Thank you. Moving to Daegu this summer and checking out to see if I should bring my ski stuff. How far from Daegu? Hi Marc, from Daegu you’d take a KTX train (1 hour) or highway bus (2 hours) to Daejeon, then from there proceed as described above (train’s faster, but requires you to get across from the train station to the bus station in Daejeon; if you do it all by bus, you just transfer in the same terminal). There may be a direct bus from Daegu to Muju, which would be a lot faster, but you’ll have to check that locally. From Daegu you can also head down to Eden Valley Resort near Busan. It’s a fair bit closer to Daegu, but the access from Busan would probably require an expensive taxi ride from the subway station (see here for info). Muju is by far the better hill of the two, but it’s good to have options! But anyway, if it was me I’d probably take my stuff! 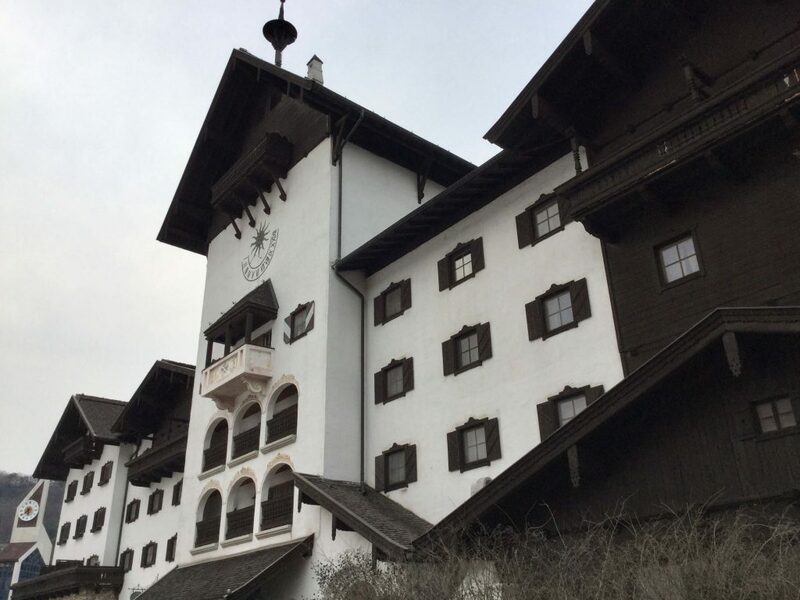 Hello, may i know how do i enquire more about the rates of hotel tirol? i check their website but there is no email for me to send and ask more details. Do you how much does it cost for beginner ice skiing there (in total)? And it will be open until when? They’ll be open until some time in mid-March (I was there on March 1st last year, the snow was already pretty slushy by then). Hello, according to the pricing on the website. it is categorised into member, general and foundation. Whats the difference between general and foundation? ‘Foundation’ is just a strange translation for the junior prices. There’s no need to book ski tickets in advance, you can just buy them at the resort’s ticket windows. Hi Simon. Thanks for the prompt reply. By junior prices, do you mean prices from children? So as an adult, I have to look at “general” prices? Hi, yes that’s right, you’ll have to pay the full price I’m afraid! But according to the website. They also categorised the prices into adult and child. Meaning there’s general, member and foundation for both adult and child. God, I hate their website, haha! But yes, I see you’re absolutely right, which means I have no clue whatsoever what ‘foundation’ means. Fact is, when I’ve been to the resort they’ve only had the adult & junior rates listed, and I don’t recall even seeing anything at all about ‘foundation’. I don’t know what it means, and I don’t think you should expect you can get it. If you do manage to, or even if you just find out what it means, please let me know! how can i get there if im in busan? Hi, you can take the KTX to Daejeon, then proceed by bus to Muju town & shuttle bus to the resort. You’d need to take a taxi from the train station to the bus station in Daejeon. I guess this would take maybe 4 hours altogether. Yeoboseyo Simon – Greetings from Colorado and great to see your excellent coverage of the ski resorts in Korea!! Muju is particularly dear to my heart as I was the designer of all the ski trails, ski lifts and snowmaking for the original developer Ssang Bang Wool; and it is the only ski resort that I designed in Asia. Muju is a great story in that we started from scratch in the National Park with no access road even; our team hiked in every day and camped on the mountain in tents for our master planning sessions. We started planning in the summer of 1988 and we constructed all the Peak 1 ski trails, 6 lifts, snowmaking, lodge and condos, and opened for riding in December 1990 – 18 months from planning to finished product; I am sure that it is still the world record! Probably, our most notable accomplishment at Muju was the construction of a major ski resort within Deogyusan National Park, while maintaining the environmental integrity of the Park for generations to enjoy. I don’t get over to Korea these days, but I hope that everyone there enjoys the Olympics and has a chance to get down to Muju for some excellent “Southern Style” riding! Thanks for the nice comments, and for sharing your Muju story – how great it is to hear from one of the original designers. That must’ve been a fantastic experience, and I hope it brings you satisfaction to know your work continues to get people out in the mountains every winter with grins on their faces! And you did a really good job at Muju – it’s by far the most attractive ski resort in Korea. Gomabseubnida, and hope you’re enjoying the Olympics from Colorado. Cheers! 1. They do have a park. A couple of the jumps looked like they had just been built and a lot of the park was blocked off when I was there, so it seems like something they are just putting together now. It is on the bottom of Raiders and can be accessed from the Yacht, Cruiser and Muju Express lifts. 2. They also have a “mogul course” (as they like to call them). It’s just a single bump line, but it’s still fun. It’s also located on Raiders, on the far left of the mid-part of Raiders, above the start of the park. It can be accessed from Cruiser and Muju Express, but not Yacht. That’s awesome mate, thanks for the update – I’m stoked to hear they’ve put a park in! Don’t think I’ll have time to hit Muju this season what with Pyeongchang, but I’ll make sure to check it out next winter. Any snow activities in March? Hello just drop by to ask whether am i allowed to have skiing there without taking any skiing lessons? Hi, yes you’re allowed to, but can you already ski? If you don’t know how to do it, it’ll be a waste of your money to rent equipment you don’t know how to use – much better (and safer) to take a lesson. How far is the resort from Kunsan Air Base? Is it close enough for a day trip? Hi Annette, if you have your own wheels it looks to be a 2-hour drive, so close enough in my book! However by public transportation the connections aren’t good so it’s more like a 4-hour journey. Hello, great info. we live on Geoje Island and have a car. We are looking to make a long weekend trip to Muju for skiing this late January or early February and will be looking at Air BnB for accommodations. How is parking around the ski area for access to skiing and is it easy to find rentals near the base of the ski area? This will be our 1st time to ski in Korea. Thanks. Hi Andy, yes there’s parking right next to the base area, and there are some rental shops in the local village at the intersection where you turn up the access road to the resort. Muju’s a nice hill, enjoy! What bus station should i go to in Daejon? Im going this weekend. Hi John, sorry I’m not familiar with Daejeon at all, the only time I’ve been there was switching buses on the way back from Muju to Seoul. I don’t know what the bus station was called, it was pretty massive though so I assumed it was the main one – there are loads of neon-plastered love motels next to it, if that helps identify it at all! * need student id or student card ! Hi Yeongsang, thanks for posting this, very useful. So 복합터미널 is the main bus terminal in Daejeon, right? Yes, it is the biggest and main bus terminal in Daejeon. Great, thanks for confirming that. Cheers mate! 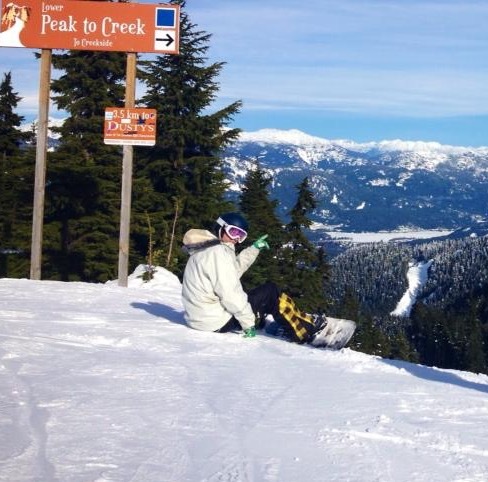 Hi team – does the resort have a shop to buy gear such as a helmet? If so, any idea about the range and prices? Here is a good link with the bus timetables from many different areas. Welcome to the 2018/19 Korean Ski Season!